The position of the turtle is somewhat controversial. In the past they were thought to have had a special relationship with crocodiles. Here is possible phylogenetic tree for the Green Sea Turtle. The Green Sea Turtle belongs to class Reptalia. This is because they are amniotes- which means eggs are protected from desiccation or other environmental problems by an extra membrane. This membrane can be a leathery or calcium based shell. They have internal fertilization. Reptiles also have epidermal scales made of protein, lungs rather than gills for respiration, and also a 3 or 4 chambered heart. Turtles are placed in the subclass Anapsida because they lack fenestration (an opening to the labyrinth of the ear). As you move down the phylogenetic tree you follow next to Order Testudines. Turtles are unmistakable. They are set apart from all other animals by their shell. This shell is not an exoskeleton. It is a modified ribcage and part of the vertebral column. Because of the shell the pectoral and pelvic girdles are uniquely located within the ribcage. From Order Testudines, you move to family Cheloniidae. These are the only turtles whose front limbs are stronger than their back. They are truly marine, with females only coming ashore to nest. This family contains large turtles and the shell is oval or heart-shaped. They have limbs that are modified into flippers for swimming (these limbs can't support the weight of a turtle on land). Chelonia is known as the crown group turtles. This genus is distinguished by its large body size and weight. From here we can now follow the next branch to the species Chelonia mydas. 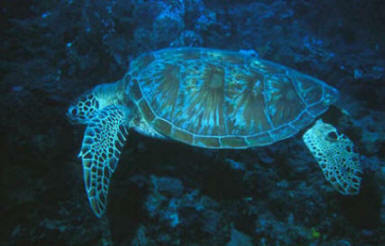 Chelonia mydas is the green sea turtle. It is separated from the other turtles of its genus because it has green fatty deposits and four coastal scoutes. Most commonly Chelonia mydas has a greenish-grey shell with darker patches on it. The underside of this turtle is white. It has a rounded head, modified flippers, and is found in warm tropical areas.